If VitaScene is being used on a Titleclip in Edius, the effect doesn´t appear or it appears on the full screen only. But the desired effect is a VitaScene effect as transition between two titles or as rays or glimmer on a title. Edius currently doesn´t support Alphachannel technology on title clips for 3rd party plugins. Once this is supported in future, also the VitaScene effect will be rendered based on this alpha channel because VitaScene supports Alphachannel technology already from Version 1.0. Until then the only workaround is the use of VitaScene as standalone version where you can import the title source(s) as Video A and B, apply the effect and export as a videoclip. This result can be reimported into Edius finally as viceoclip in the timeline. How can an effect setting of Adorage, Heroglyph, Vitascene or Mercalli being created in EDIUS directly? The target should be a specific proDAD effect based setting, ready to be used on one mouseclick within the EDIUS effects library. 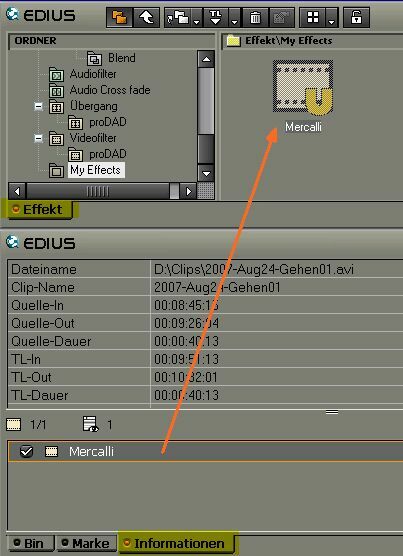 Just create an effect in the Edius timeline by applying the icon to the timeline. Customize the effect settings. Now drag the effect from the 'information' palette with holded left mouse and drop it in the window "effect" in the right side area. In case you need to sort in this preset into a specific Edius folder, please open the category before dragging the effects icon. Then you might localize your effect settings more comfortable in future. And yu also can create a proDAD favourite effects library within EDIUS. The arrow shows where the effects icon needs to be dropped. The result will be a new effect template. Which Versions of VitaScene are available? -available through the Magix retailer channel for free in Magix "Video Deluxe Audio & Effects Edition"
The program crashes after cliking the "start" button on RAW export. In most cases the reason for this problem is a tool called"Replay Converter". Uninstall the tool first and try again. If this not helps, roll back your system prior to the "Replay Converter" installation moment. Backup your current BIOS Settings. Now in the BIOS modify the value for "non local video memory"* resp. "shared memory"* to 256 MB or higher. (*) Depending on your used BIOS this values naming can be different. For damages due to improper modifications proDAD GmbH can´t assume liability. How fast is a system using GPU rendering? On some systems, the CPU (Central Processing Unit), located on the motherboard, is responsible for general graphic/video processing. If no graphics card is installed, all the rendering of graphics or video, must be done by the CPU. On a system with a modern graphics board installed, the GPU (Graphic Processing Unit) assumes the processing load for much of the specialized graphic operations. A GPU is located on the graphic card and acts as a co-processor, along with the CPU.As a general rule, the speed and effectiveness of a GPU is usually dependent on its age. Modern graphic boards that include newer GPU's, normally perform many times faster than older graphic boards. To evaluate the processor load "Process Explorer v10.21" has been used. This a modern system with an installed graphics board. Notice the very low CPU/GPU processor load. Because modern GPU's are much more effcient in their specialized processing, this allows the CPU to be much more efficient. As a result, the overall speed and efficiency of the system is enhanced dramatically. This is an older system with an older graphics card. Because there is no GPU to take up the load, the "kernel" processing, as well as the application processing are pushing the CPU up to 50 percent of capactiy. This means:VitaScene can be used on older graphic boards which are compatible with DirectX 9c (just check with the Check-program in the bottom link). But with older technology, a performance loss must be expected.But even this loss in performance, from an older graphics card, will never be as high as loss in performance that comes from using CPU-rendering only.Remedy in terms of maximum speed and performance:Use an up-to-date graphic board. We suggest that ideally, a PCI-Express board will provide the best performance. Very low CPU/GPU processor load using a up-to-date graphic board in a modern Multimedia-System. Very high CPU/GPU processor load using an obsolete poor graphic board in a typical Office-PC.